Challenge your speed and agility using a tiled floor as a speed ladder, or small objects laid out as obstacles to weave through. Test your speed and reactions using this fun game. 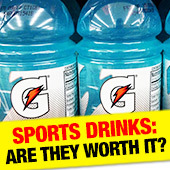 You'll need a friend and a wooden stick (around chest height). Ask your friend to hold the stick upright with one end on the floor, and then step back, allowing the stick to drop in any direction. The aim of the game is to catch the stick as close to the floor as possible. Up the intensity by lunging or squatting to reach the stick, or performing a burpee each time you miss it. This drill is one of my all-time favourite movement specific warm-ups, and always goes down a treat with clients! 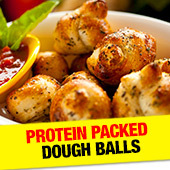 Healthy Dough Balls - The perfect protein-packed side to any pizza!